Dixon's Auction » Venture 9' Classic Shuffleboard Table Auction. Venture 9' Classic Shuffleboard Table Auction. Venture 9' Classic Cushion Shuffleboard Table Auction. Payment Instructions: Your credit card will be charged for purchases at the end of auction. Shipping Instructions: Customer is responsible for shipping & handling charges. Auction house will help arrange shipping. Merchandise will ship out within 5-6 business days after auction. Preview Date & Times: Monday Thru Friday 10:00am-1:00pm And 2:00pm-5:00pm @ 10101 Brook Road Suite 680, Glen Allen, VA. 23059. Checkout Date & Times: All items must be picked up within 1 business day of the auction closing. Pickup is at 10101 Brook Road Suite 680, Glen Allen VA. 23059. We are open Monday-Friday between 10AM & 6PM (Closed between 1 & 2 for lunch) or Saturdays between 11AM & 3PM. VENTURE 9' CLASSIC CUSHION SHUFFLEBOARD TABLE. VENTURE 9' CLASSIC CUSHION SHUFFLEBOARD TABLE. 3 POINT SCORING SYSTEM. MEASURES 108" L BY 32" W BY 31" TALL. 1-3/4" THICK PLAYING SURFACE, COATED WITH VENTURE SHUFFLEBOARD'S EXCLUSIVE HARD CLEAR SYNTHETIC LACQUER. INCLUDES (4) RED & (4) BLUE WEIGHTS. ALSO INCLUDES A BOX OF (3) TRIPLE CROWN LIQUID SHUFFLEBOARD WAX, (2) TRIPLE CROWN SHUFFLEBOARD POLISH, (1) TRIPLE CROWN SILICONE SHUFFLEBOARD SPRAY & (1) TOURNAMENT GOLD SHUFFLEBOARD POWDER. THIS SHUFFLEBOARD RETAILS FOR AROUND $4,000 FROM VENTURE THEMSELVES. WOULD MAKE AN EXCELLENT ADDITION TO ANY GAME ROOM OR MAN CAVE. 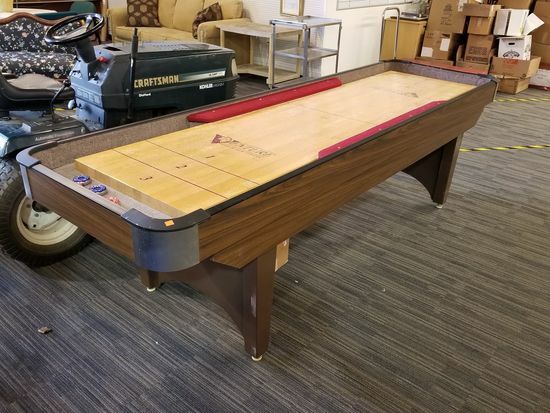 DELIVERY IS AVAILABLE FOR THIS SHUFFLEBOARD WITHIN 150 MILES, PLEASE CALL 804-598-5099 FOR QUOTES OR ANY OTHER QUESTIONS. You've been outbid to R****1! to YOU!